Chef Connie and her students headed for television? 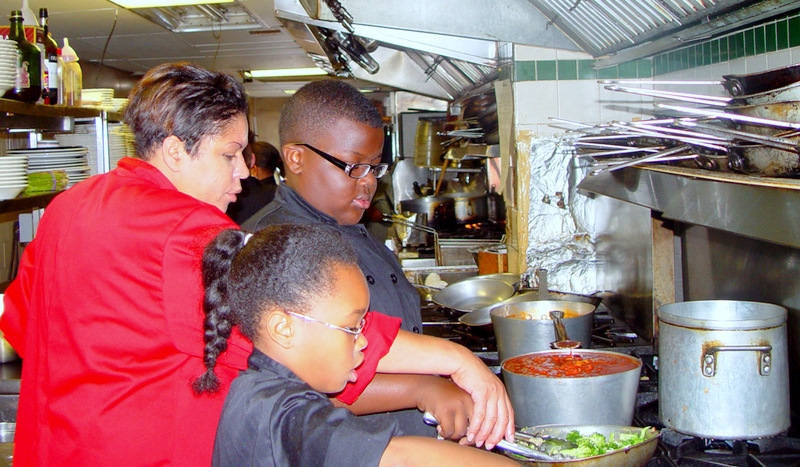 Above: Chef Connie Johnson directing Anjuan Collins and Sydney Pinkett at the stove. They’ve mastered preparing and serving meals for hundreds, but do Chef Connie Johnson and her culinary arts students from Baltimore’s Calvin Rodwell Elementary School have what it takes to become a television series? They’re hoping the answer is “yes.” The Brew caught up with them recently, after hearing that they are shopping around a promotional video and have attracted some attention in high places. Another of Johnson’s fans, as she tried to take her project to the next level, is celebrity chef Marc Bynum. Bynum has been a chef in several 3-star Long Island restaurants and was a finalist on the Food Network’s Chopped. A consultant and event planner, Bynum is also encouraging the idea of a “Chef’s Angels” show. As a voice speaking up about childhood obesity and depression, Bynum likes Johnson’s emphasis on positive participation and healthy eating. As The Brew has reported, Johnson has created in Northwest Baltimore a unique culinary arts and catering program with a compelling plot line – young kids in a challenging urban neighborhood called upon to perform at a professional level by a warm-but-exacting chef-mom with her own poignant back-story. The TV show idea sounded promising, given Johnson’s proven skills not just in the kitchen but with the task of getting backers, sponsors and community buy-in. It seemed like a good time to catch up with the group and so, recently, I joined Johnson and some of her “angels” at Ciao Bella Italian Restaurant in Baltimore’s Little Italy, as they prepared vegetable lasagna for our lunch. The restaurant’s owner/chef Tony Gambino seemed pleased to host the group, and will be hosting additional events for them. The children participating that day were Christian Andrews, Kaaliyah Cary-Johnson, Anjuan Collins, Safiya Davis, Valerie Nagel and Sydney Pinkett. Seated in a quiet corner of the restaurant and suited up in professional black chef coats, they were told the merits of the ingredients. Each seemed not only ready, but eager, to get into a professional kitchen to prep and cook. Once they were in place, Chef Connie (as she’s addressed at Calvin Rodwell) assigned each chef an ingredient and the kids smartly stepped up to the task and seasoned, sliced, stirred and sautéed. The broccoli, zucchini, asparagus, mushrooms, ricotta cheese, shredded cheddar cheese and Monterey jack cheese were made ready, and the lasagna sheets were boiled and drained. Melvin Johnson, Chef Connie’s husband, and Stephanie Brown, her executive assistant, were on hand that day to give the youngsters extra support and guidance. They navigated the narrow kitchen with enthusiasm and agility. It was great to watch them – not only were they intent on their task but, even more impressively, the students worked as a calm collaborative team with a clear goal. After cleaning their work stations, the young chefs removed their jackets and washed up in readiness to share their lasagna with the adults. Back in Ciao Bella’s dining room, they chatted until lunch was ready and the adults talked, as well. Johnson, an experienced professional chef, has defined her mission as working with youngsters. Her goal, she said, is to help them combine cooking skills with knowledge of nutrition and to leave them with a more-than-token grasp of the pleasures of healthy eating. These kids understand that they are not only learning culinary ABCs, but the social pleasures and lifestyle skills that attend them. Motivated in part by First Lady Michelle Obama’s “Let’s Move” initiative, Johnson has invited Kristy Scheffenacker, a fitness consultant, to be one of the group’s advisers. When the lasagna was ready, Chef Connie brought it out and served generous portions to all assembled. Suddenly there was a hush in the room and the food pros among us knew what that means. People are savoring their food. Everyone is smiling. For more information about Chef’s Angels and Connie Johnson’s program, contact Angela Byrd at PerCept.